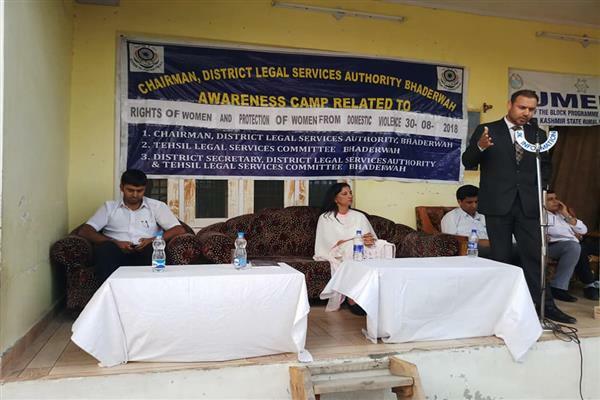 BHADERWAH,AUG 30 (KNO) A Legal Awareness Camp relating to the rights of Women and Protection of Women from Domestic Violence (PWDV) Act, was organized in the premises of district Court complex Bhaderwah , here today under the chairmanship of M K Sharma , (Pr District and Sessions Judge Bhaderwah) Chairman District Legal Services Authority, Doda whereas Chairman Tehsil Legal Services Committee Renu Dogra Sub Judge Bhaderwah and Secretary DLSA Mudasar Farooq , Munsif Judge was also present on the occasion . Speaking on the occasion, the Munsif Judge Musasar Farooq stressed upon the female folks to be acquainted with their legal rights and understand the procedure of access to the legal institutions and encouraged them to come forward in raising their issues. Highlighting various aspects of women’s rights and legislations, he said the government has made several Acts to safeguard the rights of women and they must approach the concerned institution during any peculiar circumstances.Child abuse, dowry-related violence, domestic violence, eve-teasing and other related crimes against women are manifestations of various forms of social evils prevailing in our society and we need to fight these collectively, he asserted. He further divulged at length on provisions of the Constitution and Legislations by virtue of which such issues can be redressed and victims are brought out of distressful condition.Advocate Manjeet Razdan , Advocate Wabhav , Advocate Bhawan , Advocate Sunil Sharma and Advocate Mohd Majid Malik delivered lecture on Hindu Marriage Act and Muslim Personal Law and rights of women respectively besides Sexual Harassment-a form of sexual violence against women while other speakers also threw light on social status and issues of women.